Der hier untersuchte Yoshida Shinto wurde im 15. Jahrhundert von Yoshida Kanetomo (1435 – 1511) begründet und war v. a. im 17. und 18. Jh. äußerst einflussreich. Er gilt als erste religiöse Richtung, die sich selbst als „Shinto” (Weg der Götter) bezeichnete, und entwickelte eine Theologie, die sich explizit vom Buddhismus distanzierte. 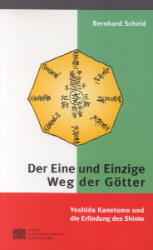 Folgerichtig nannte er sich der „Eine und Einzige Weg der Götter” (Yuiitsu Shinto). Die Studie untersucht, welche Neuerungen damit tatsächlich verbunden waren und aus welchem historischen und geistesgeschichtlichen Kontext sie erklärbar sind. Damit wird auch die allgemeine Frage angeschnitten, inwiefern im Yoshida Shinto ein erstmaliges Bewusstsein von Shinto als eigenstÃ¤ndiger Religionsform gegeben ist. Unter Experten ist weithin bekannt, dass der Yoshida Shinto sowohl vom Buddhismus als auch vom Taoismus entscheidend geprägt wurde. Nach Meinung des Autors wird jedoch häufig unterschätzt, wie schlüssig Yoshida Kanetomo diese Einflüsse zusammen mit indigenen („shintoistischen”) Elementen aus dem Ritualwesen und der Mythologie in ein umfassendes religiöses System integrierte. Die Studie stellt die erste umfassende Monographie zum Yoshida Shinto in westlicher Sprache dar und enthält zudem Übersetzungen von drei wichtigen Yoshida-Schriften. Sie versteht sich als Beitrag zur aktuellen Diskussion um den Begriff „Shinto”, der gegenwärtig sowohl in Japan als auch im Westen neu hinterfragt wird. Yoshida Shinto, the subject of this study, was founded in the 15th century by Yoshida Kanetomo (1435 – 1511) and was particularly influential above all in the 17th and 18th centuries. It is regarded as the first religious movement that referred to itself as “Shinto” (the Way of the Gods), and developed a theology that explicitly distanced itself from Buddhism. Consequently, it called itself the “One and Only Way of the Gods” (Yuiitsu Shinto). This study examines the innovations that are actually involved and the historical and intellectual context in which they can be explained. The general question is also addressed of the extent to which there was a first awareness of Shinto as an independent form of religion in Yoshida Shinto. It is broadly known amongst experts that Yoshida Shinto was decisively influenced both by Buddhism and by Taoism. In the opinion of the author, however, there is a general underestimation of the extent to which Yoshida Kanetomo successfully integrated these influences together with indigenous (“Shintoist”) elements from the world of ritual and mythology to create a comprehensive religious system. The study constitutes the first comprehensive monograph on Yoshida Shinto in a western language, and also contains translations of the three Yoshida writings. It is a contribution to the current discussion about the term “Shinto” which is at present being re-examined both in Japan and the west.